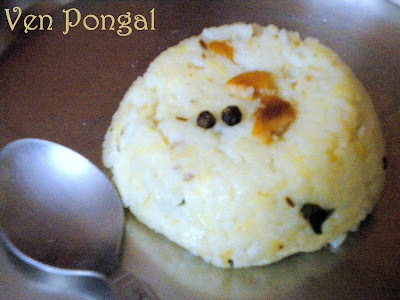 Pongal is a filling and scrumptious one pot alternate to rice. It is a traditional breakfast item in South India. But since our family prefers only oats for breakfast, we have this for dinner. Pongal is also offered to God as Neyvedhiyam. One of the best pongals I’ve ever had is at the Nanganallur Aanjaneya Temple. Pongal is a combination of rice and moong dal, tempered with black pepper, cumin seeds and cashews in ghee. It comes in very handy when you are out of the idli/dosa batter and are in no mood to spend a lot of time in the kitchen making roti and sabzi. This is best served with Gothsu, Sambar or Coconut Chutney. Wash rice and dal and pressure cook them together with 4 cups of water for about 3 to 4 whistles. The rice and dal mixture should be mushy. Pulse the pepper and cumin for just about 30 secs. Grate ginger. Heat a Kadai with ghee and oil. Add the cashew nuts and fry till they change color. Next add the pepper -cumin seed coarse powder and hing, sauté for about ½ a minute. Next add the grated ginger and curry leaves. Fry for a minute. Mash the rice and dal well and add it to this. Add salt, ½ cup milk and mix well till the milk is almost absorbed. Ven Pongal is ready. Serve immediately with coconut chutney, Sambar or Gothsu. 1. The Pongal should be eaten hot, else it will become hard and you will not enjoy the taste. 2. Always keep the pongal a little loose in consistency, since it will tighten as it cools. Also if you feel that the pongal is too thick, then add some hot water and mix well. Hubby's favorite .. perfect with coconut chutney. This is a lovely looking dish. Hot, freshly made, delicious ven pongal!! Wow this is my daughter's fav...luks really tempting. Looks delicious, makes me hungry dear.. Thanks for sending your entry dear. Delicious looking pongal..making me drool. It's so true that pongal is such a filling and yummy meal, looks very inviting. Looks delicious! A very nice recipe! Browsing the web of blogs, I ended up here in yours. I love your blog: Recipes, graphics, all the interesting content. I have added to your followers so you do not lose more sight. If you like,come in my blog... you're welcome. That looks yummy... Thanks for visiting my blog and leaving your lovely comments. Whenever i hear or see pongal, I remember prasadam from temple. With the aroma of ghee they would be delicious. perfect picture of a huge favorite in our home!!! makes me hungry Kaveri!!! Ooh.. Pongal is such a comfort food for me.. love them with coconut chutney.. Sounds like a great way to start the day. Yum!